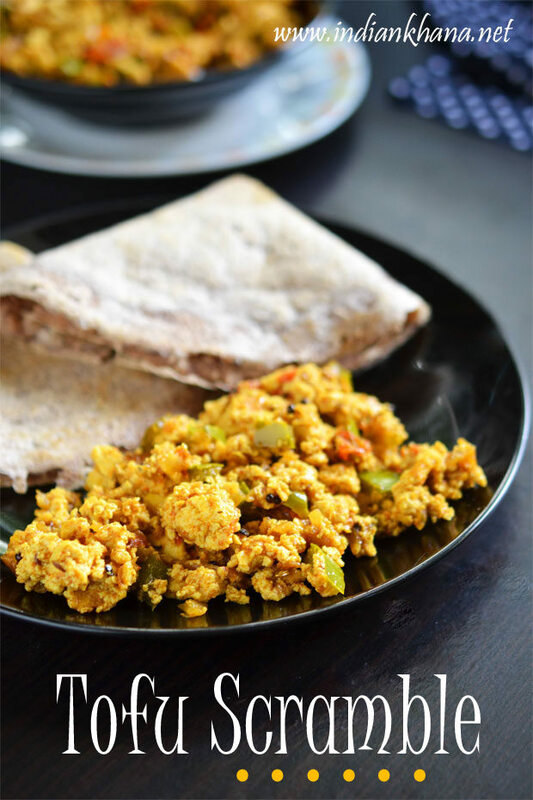 Masala Tofu Bhurji or tofu scramble also called as soy (soya) paneer bhurji is vegan, gluten-free and spiced scrambled, works perfect side dish for bread, toast, pav, roti, paratha, variety rice or even dosa. 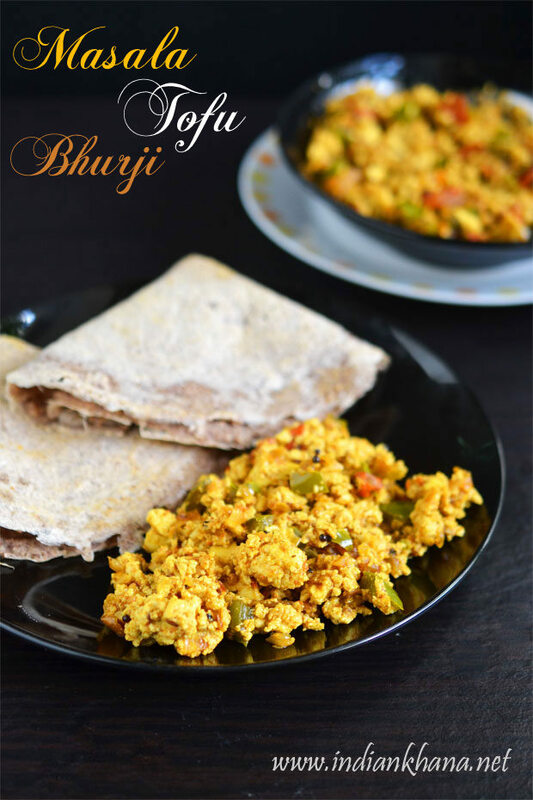 Tofu is healthy alternative for paneer which is low in fat and high in protein and this tofu bhurji is vegan version of popular paneer bhurji or egg bhurji. Tofu works as great substitute for vegan people. 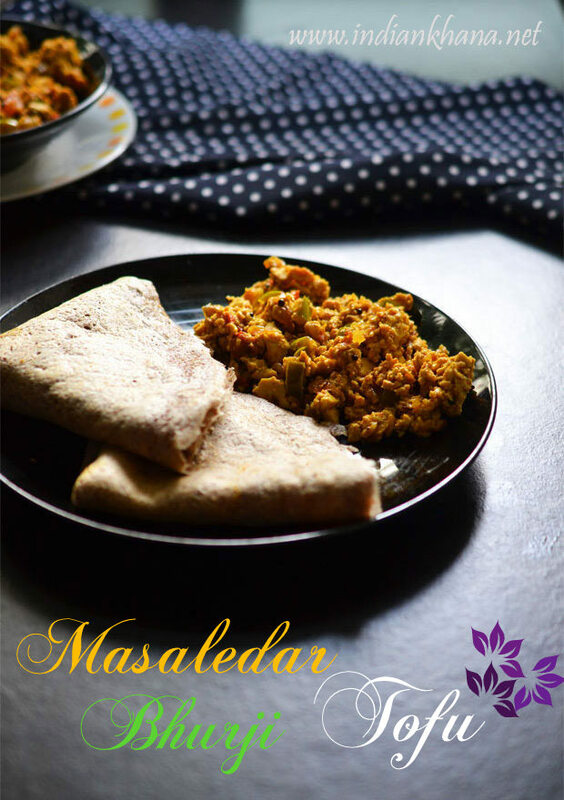 As tofu is bland in taste, I have added different spices to make simple bhurji more flavorful and tofu (soya paneer) does absorb all the flavors well, so it's call masaledar tofu bhurji. We have to use firm tofu for making bhurji and it known as Tau Kwa in Chinese. This tofu bhurji is very tasty and doesn't really taste like normal tofu dish. 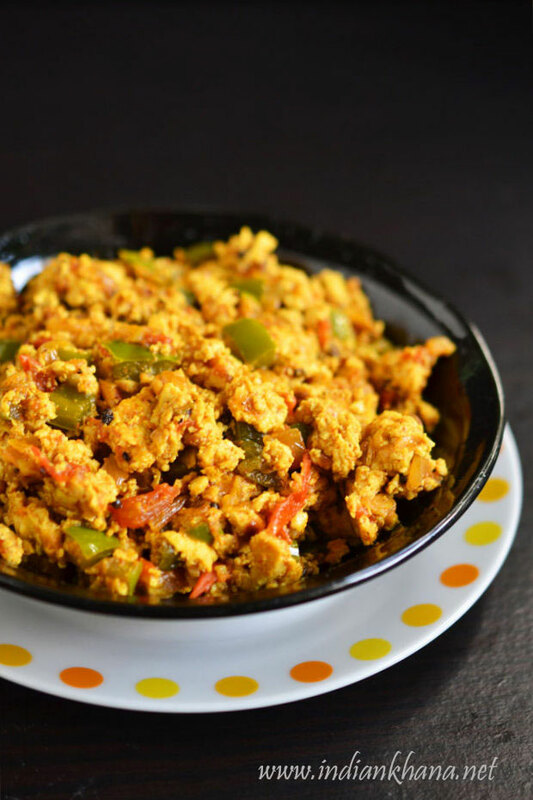 Capsicum adds wonderful flavor to this bhurji so try not to skip that. 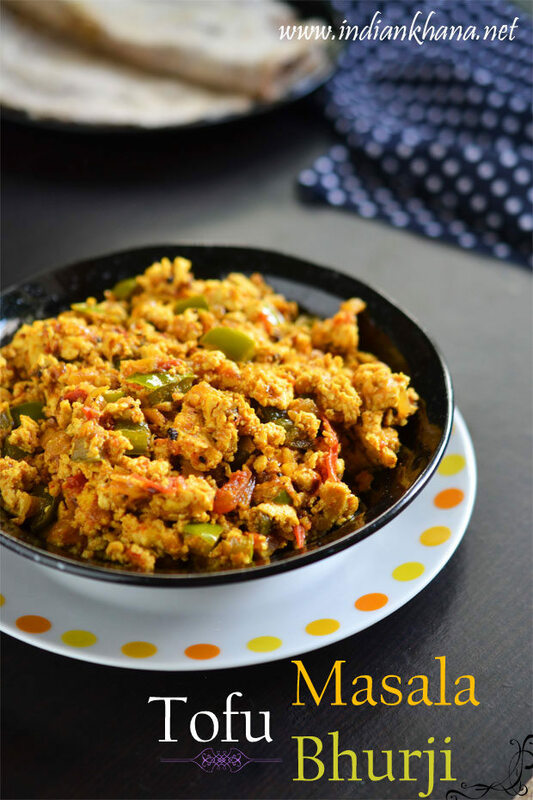 The best thing about this recipe is that we can use this bhurji in multiple ways we can serve this as side dish for breakfast with toasted bread, pav or even for lunch, dinner with roti, paratha or serve as a side with any variety rice. Normally I serve this bhurji with bread toast but this time I had it with Instant Bajra Dosa and it was delicious combination too. You can also check my Pineapple Tofu Manchurian, great guilt-free manchurian recipe. Do try this simple soya paneer bhurji, this also good option for lunch box to pack along paratha, rice or anything of your choice. You can also make breakfast burrito or even for your kid lunch box. 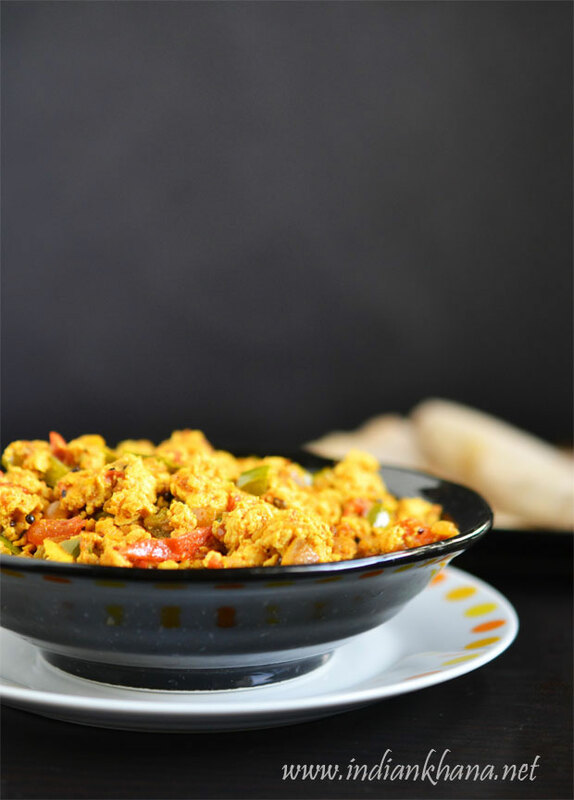 Vegan, gluten-free tofu scramble with Indian spices. Open tofu pack, drain all water, rinse tofu well in tap water and pat dry in kitcen towel to remove excess water. Scramble tofu with hand and keep aside. Peel and finely chop onion, green chili, tomato, coriander leaves (Cilantro) and capsicum (bell pepper). Heat oil in a pan or wok/kadai add cumin seeds, mustard seeds, fennel seeds and allow to splutter. Add onion, green chili, ginger-garlic paste, mix and saute in medium heat until onion becomes soft and golden brown, do stir in interval. Add red chili powder, turmeric powder, coriander powder mix and cook for a minute. add tomato stir, cover and cook in slow to medium flame until tomato gets mashed fully, stir in intervals to avoid burning. Add capsicum and cook for a minute in medium flame, now add salt, garam masala, pepper powder and mix well. Add tofu and mix, cook for 3-4 mins in medium flame or until bhurji becomes dry and no moist left. Add lemon juice, coriander leaves mix and off flame. Serve hot or warm with toast, pav, roti, paratha, rice variety or even dosa. You can add green, red, yellow capsicum to make it colorful. You can place same bhurji in bread to make bread roll. You can replace tofu with paneer or egg to make paneer bhurji or egg bhurji. Delicious, masaledar tofu (soya panner) bhurji.